I have just returned from a trip to Copenhagen. Last time we were there, we just used some tourist maps. This time the idea was to rely on apps on my Android phone. In Norway I use Google Maps for this. For this trip I planned to try three different apps: Google Maps, OsmAnd+ and NDrive and they all were to be used while walking. And; I would have no data conncetion while walking around. The data roaming is just too expensive. I had made Copenhagen available offline in Google Maps. But I quickly learned that I could not search for streets on the map, only view the map and where I was. This made the map more or less useless for me. Maybe I have misunderstood something? NDrive is a GPS app for car navigation. I thought it might be able to give directions for walking too, not only cars, but I never found such a feature. This quickly made this useless aswell. This left me with OsmAnd+. I had downloaded the map for Denmark before I left Norway. The maps come from OpenStreetMap. I love the idea of OpenStreetMap, but haven’t used the web maps much. The map graphics is not as beautiful as Google Maps, and the features and smoothness of Google Maps has always been better to me. This was the first time I tried maps from OpenStreetMap in an Android app. OsmAnd+ has a way to go on the user interface. The blue arrow points to the direction you are moving. This may work when driving a car. While walking I found it to be quite unreliable. It uses too much time to calculate the direction, and I pretty much had to ignore it all together. The blue arc shows the angle of view. This means forward as you hold your phone. I made a terrible mistake on the first two attempts and had not disabled screen rotation. As you hold your phone horizontal, which I did most of the time, itt turned back and forth (but only while I was not looking). I didn’t notice actually, although the controls also rotates, but this made the angle of view to shift a lot. It took some time before I realized how it all worked. What was the blue arrow? And how was it different to the blue arc? It all shifted to a new direction all the time. In addition, it has a red arrow. This point in the line of sight to the destination. The first navigation was to the LEGO brand store in Strøget. I had already found the destination and stored it as a favorite. The only problem was: When we arrived at the destination, there were no LEGO shops around. What was going on? It turned out that the favorite was misplaced. I have no idea how this happened. The trick is to search for an address, look at it on the map, long press the marker and save it as a favorite. How this went wrong, I have no idea. When I made another attempt and searched for the street address, we found it alright. Another terribly frustrating thing is that it uses as lot of time before it recalculates the route. I can imagine the algorithm is made for car driving, and is triggered when the off distance is greater than a certain value. Many times we disagreed on the route of choice. More than once it chose a route that could not possibly be the fastest one. Not a big problem though, in theory. I could just walk another way and wait for the app to recalculate. But I had to walk a great distance, up to at least 200 meters before it recalculated. In the meantime it wanted me to go back the same way I came from just to walk down a parallel street. And the calculated distance left just increased as we went. How could it possibly use that much time to figure out that walking back 200 meters was a bad idea when I was on the next street 20 meters away? They really have to use an other algorithm for walking. Searching is an other great problem. 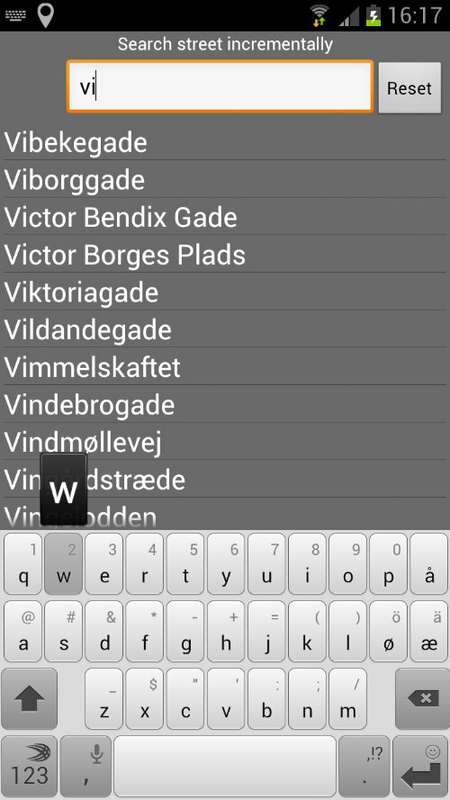 The interface is OK. First; choose a country, then a city, and then finally street and street number. The problem is that many streets are not to be found. You can zoom into the map and read the street address, but when you search for it, it won’t show up. This was a big disadvantage. At one point I sat on the hotel with a wifi connection, searched for the street on google maps and tried to remember where it was so I could find it again in OsmAnd+. Then I could finally get directions to the place. I have no idea how it is possible to make like this. Compared to the map data, the Street names can not be that much data. When you can’t find the street, the app is more or less useless. The final frustrating thing was an app update. While sitting on a wifi connection at the hotel, there came an update to the app. Route calculations should be much faster. Hurray!! I downloaded it and was eager to test the difference. But when we stood on the street somewhere in Copenhagen and I started the app, it found no map of Denmark. I had to download it again when we came back to the hotel. 258 MB! As a developer you must warn about this in the changelog. In the meantime we had to rely on the tourist map which was pretty simple. This leaves me with a bad taste in the mouth. I really, really wanted to like this app. 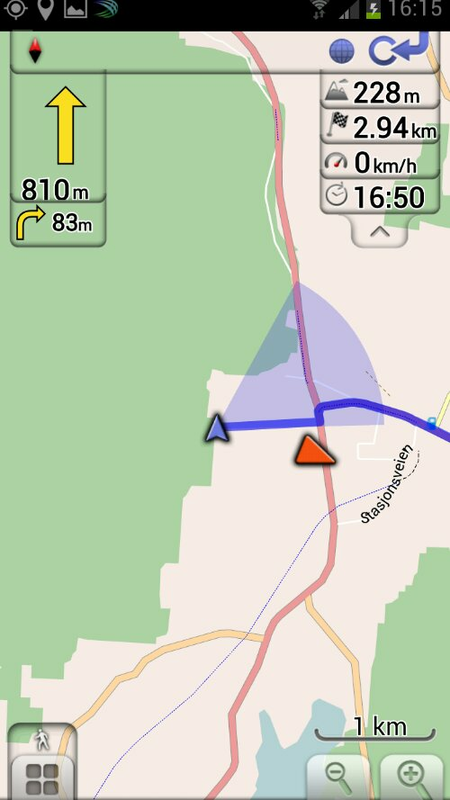 As one of the most promising OpenStreetMap apps around, I had a very positive attitude towards it before we took it into use. But it failed in so many ways that I just can not say it is good enough to rely on. Without a tourist map and Google Maps on the hotel room, we would have failed to find many places. What will I do next time I have no data connection? I really don’t know. I hope all the alternatives are better until then. Next: Next post: Makro, elg og landskapsfoto – Alt på samme tur!